I had had a really bad day the day I read the email giving us the theme for this month’s reveal. Literally going around in circles and achieving nothing so I knew immediately the title for my quilt. To cheer myself up I decided to use my favourite split complementary colour scheme in orange and turquoise. The inspiration for the background design came from a photo I had taken of a rug that was in a hotel I was staying at near Wadi Shab, Oman. It has been constructed in two parts. The background fabric was printed with acrylic paints using a combination of hand cut soft cut blocks and hand made funky foam stamps and then over-dyed with thickened dye. This was then layered and free-motion quilted with a combination of pebbles and my version of a Leah Day design I think of as tennis balls! I then printed the footprints onto a separate piece of fabric, again using acrylic paints and hand cut soft cut blocks. The lettering was stenciled using a hand cut stencil and a shiva paintstick. 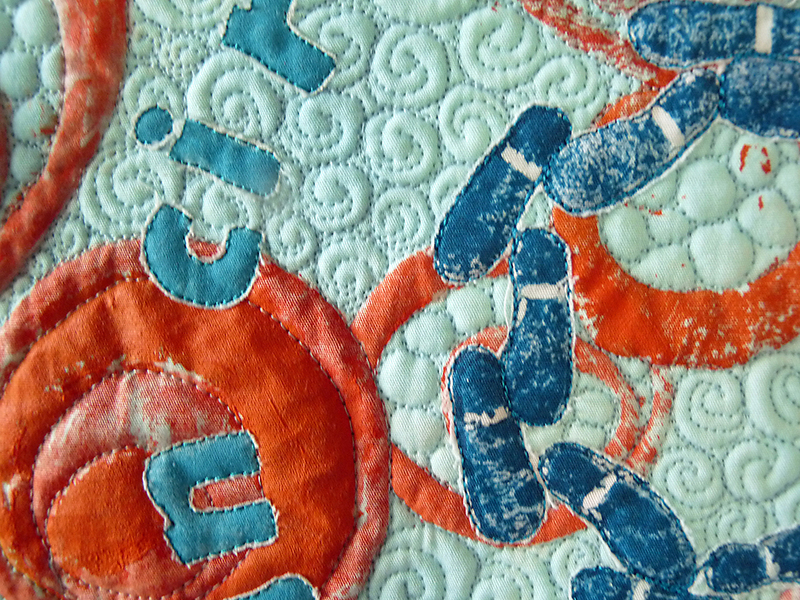 I then layered this fabric over the background, outline quilted around the footprints and letters and then cut away the excess fabric (thank you to Linda and Laura Kemshall for the idea). I had remembered to print enough fabric to be able to bind the quilt in the same fabric. I thoroughly enjoyed making this quilt including all the sampling I did before I decided on the final construction technique. Overall I am satisfied with the final result. What fun! The split-complementary colours are just right, and I love the footprints and text going ’round the centre. Very effective and full of interesting techniques! Gaye I love all the different techniques you have used. It makes me really feel going around in circles. Round and round and up and down we goooooo again, this is my feeling by your quilt. I love the idea of the footsteps, the techniques, the quilting and the colours you used. Gaye, I read your description and looked at your piece a number of times and you have certainly conveyed going around in circles, just so many techniques to absorb. Yes, you should be really satisfied with this piece. The colour combination is a favourite of mine as well. The feet are a great touch. I like your choice of colours, and the movement given by the steps ! your quilting is beautiful ! What a great version. I love the different quilt fills, and it is a unique interpretation of the theme. Lovely interpretation and beautiful stitching with a great colour palette. I certainly know the feeling! The design is wonderful; it captures the “too much going on at once” part of going around in circles. Great quilting, too! 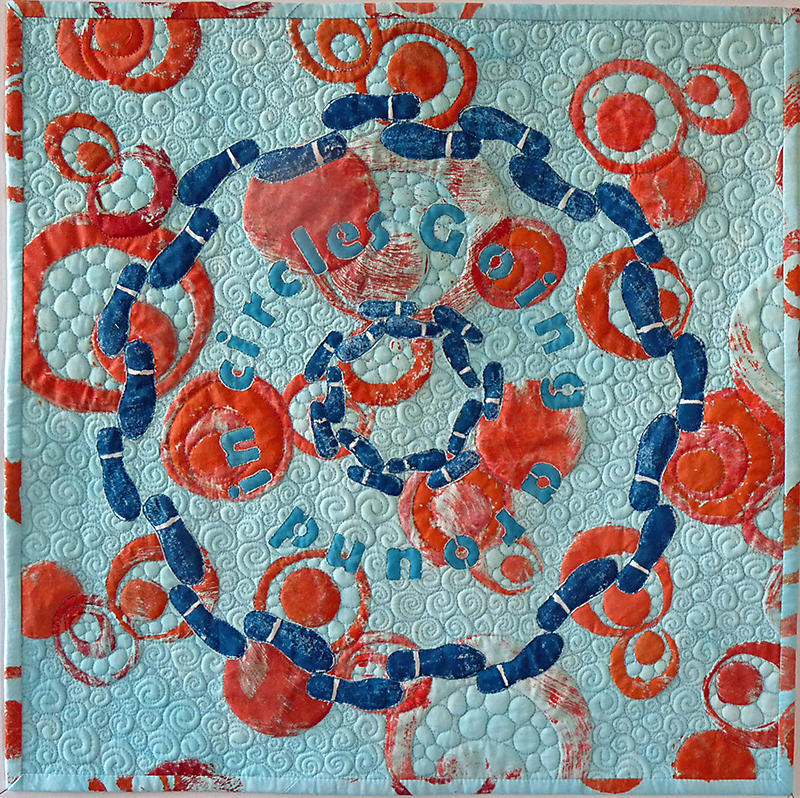 Love the colour combination and the circles of orange, the circles of quilting and then the circles of footprints. The stamping looks good too. Gaye, I agree with the comments above. What a lovely quilt! I really like you tennis ball quilting. Great how you did the footprints and letters in circles.